A four-person team from Guyana’s General Registrar’s Office (GRO) registered over 170 Guyanese for birth certificates over the past two days as part of efforts to tackle low registration in Region One (Barima-Waini), government said Wednesday. The new registrations were made during the first two days of the Registration Outreach activity by the GRO officials and guided by Member of Parliament, Mr. Richard Allen and assisted by local community leaders, government’s Department of Public Information (DPI) said. 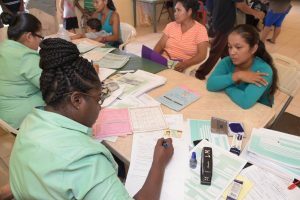 The GRO has conducted a number of outreaches to hinterland areas in recent years to make sure that no Guyanese is left behind when it comes to documentation, the most recent being to Mahdia, Potaro-Siparuni (Region Eight) last month. The week-long outreach to Region One, the second of its kind for the year, specifically targets persons, who have never had, have lost, or wish to make changes to their birth certificates. Up to Wednesday the team had completed registrations for residents of Port Kaituma and Falls Top. In the coming days, the team will visit Four Miles and Sebai before returning to Port Kaituma for a final registration session on Friday. Searcher at the GRO, Ms. Arianne Williams helps this mother register the birth of her son during a registration outreach session, held at the Port Kaituma Community Centre. Searcher and Transcriber at the GRO, Ms. Lavern Small-Khan spoke about the importance of the outreach, emphasising that a birth certificate is an important foundational document that allows for better opportunities for all Guyanese. 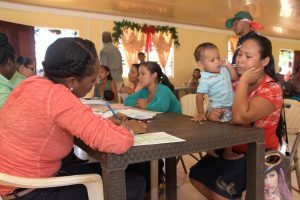 “The outreach is very important to those persons [because] we’re helping them to get a birth certificate for the first time… A birth certificate [is] not only for school but [also] your ID card [and] your passport. To do everything you’d need your birth certificate because that’s [first] proof [that] you are… Guyanese… Your birth certificate would say that you’re a citizen of this land… Every [piece of] information on that certificate is very, very important,” she said. Underscoring the importance of Government putting adequate systems in place, such as the current outreach, Ms. Small-Kahn also said that low registration rates in hinterland areas are due to both practical and educational challenges. “Being out in the field… you kind of see the challenges these people have in terms of the distance they have to go [to] register these children. I’m not saying… that they ought not to go, but it’s challenging for some of them because… they have to walk to get to these places… It would take [some of] them days to get there… I don’t think they see the importance of [registration] and, a lot of them… [their] parents [are] not [literate] and it [passes on] to the generations to come,” she said. Mr. Allen said that the task of registering all Guyanese is great and although achievable, it cannot be done overnight. “We’ve been looking at registrations of children and adults across the country… We’ve been working in collaboration with the Ministry of Citizenship, which [has] a mandate to ensure that all citizens are registered… If we have staff that is working directly with GRO… We’ll be able to work systematically and get it done, but it’s going to take some time. It will take a period to get people registered and that is where my heart is; seeing the residents be registered,” the parliamentarian was quoted as saying by the Department of Public Information. There to help to track down accurate birth records, Senior Midwife at the Port Kaituma Hospital, Ms. Genevieve Hernandez spoke about the education initiatives in place to help combat the late registration rates. “We do have [classes] and registration of births is one of the topics… We enlighten them… We [also] have quite a few hand outs we’ll be able to share and I would explain to them the importance [of registration]… Some didn’t understand but as the child grows… the school would call [the parents] and tell them that it’s a must… [Then] they see it as something very important,” she said. While the Government continues its assessment on the placement of permanent offices, Social Worker at the Ministry of Indigenous Peoples’ Affairs, Ms. Farina James said that while the outreaches do help a lot, there is still need for more permanent registrars in the area. “We really need people, even if someone could be permanent because it’s costly [for residents]… If they don’t have their birth certificates they can’t do [anything], even get their [Taxpayer Identification Number (TIN)]. The [outreaches] are helping out a great lot. People are eager to come out and get registered,” said. The GRO, government said, is unwilling to let any Guyanese be left behind when it comes to documentation. Registration outreaches like these are crucial to achieving the Ministry of Citizenship’s goal of a 100 percent registration rate. This outreach team, comprised of Searcher/Transcriber, Ms. Lisa Major, Searcher, Ms. Arianne Williams, and Transcriber, Ms. Diana Allicock, have identified Region One as the largest area of need in Guyana. Residents of the surrounding villages, Baramita, Big Creek, and Matthews Ridge participated in the Falls Top registration session.